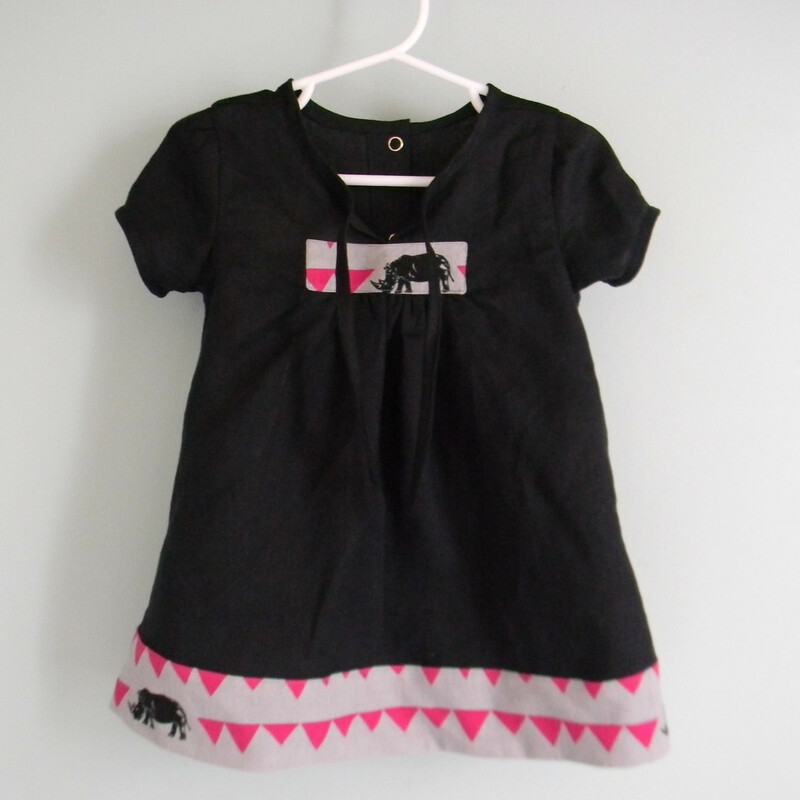 Here is the next installment of the “My Favorite Oliver + S Pattern” series. Today we have Audrey who is a big fan of skirts. She is going to share a bit about her favorite skirt. Thanks so much for being here Audrey! Choose my favorite Oliver + S skirt pattern? Wow, that one is very tough! Hello Oliver + S fans! 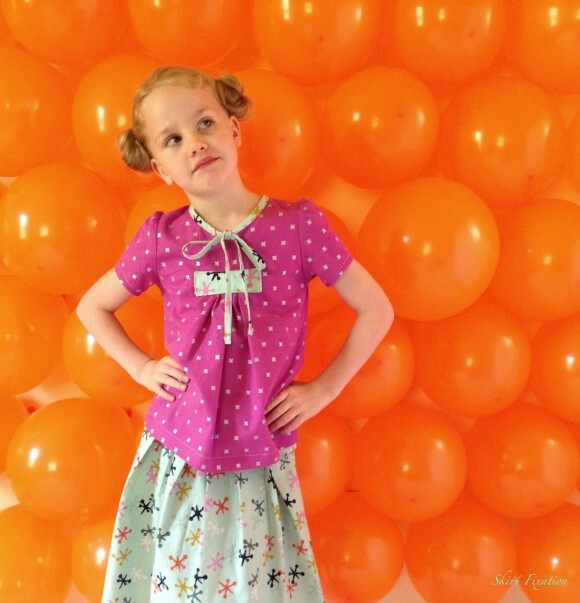 My name is Audrey and I blog with my daughters over at Skirt Fixation, mostly about skirts. 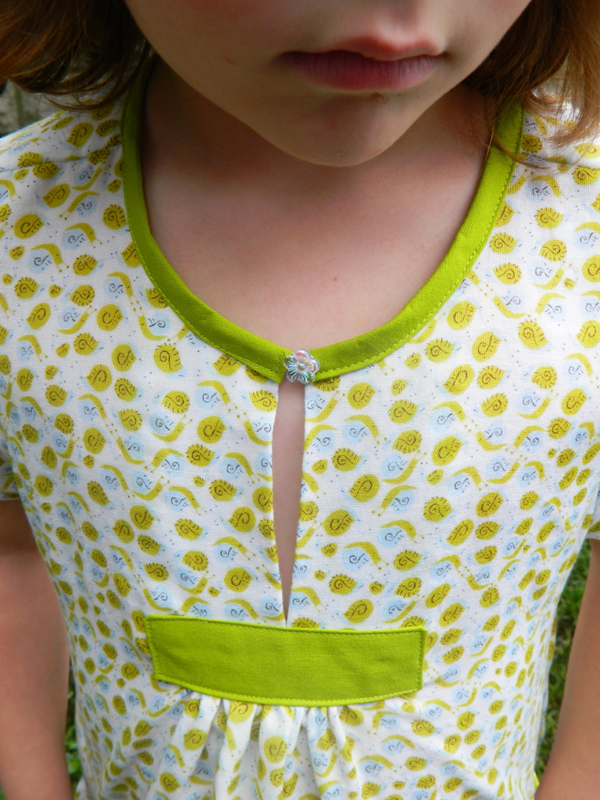 The first Oliver + S pattern I sewed was the Croquet Dress, as a top and skirt, of course! Recently, I sewed up all 11 Oliver + S skirt patterns (9 from the Oliver + S shop and both free patterns) for the All The Skirts series on our blog. I loved each and every one of the Oliver + S skirt patterns; each one is so unique and special in it’s own way. So choosing just one as my favorite was especially difficult. 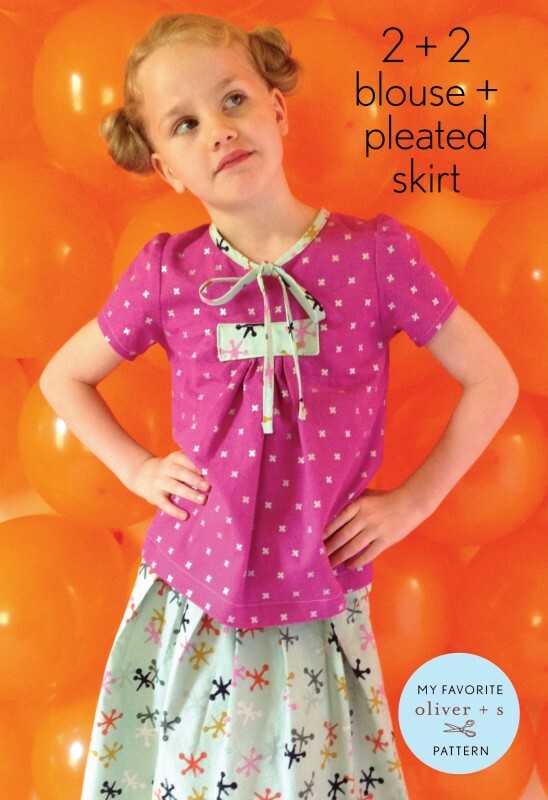 Finally, I sat down with my youngest daughter, who was the recipient of 10 of the 11 Oliver + S skirts I made, and we settled on the 2 + 2 Blouse + Pleated Skirt pattern. Some contributors to the “My Favorite Pattern” series have sewn up their favorite pattern many, many times, but I’ve only sewn up the 2 + 2 once. That turned out to be the exact number of times it took for me to fall in love with it! Let’s start with the 2 + 2 pleated skirt. 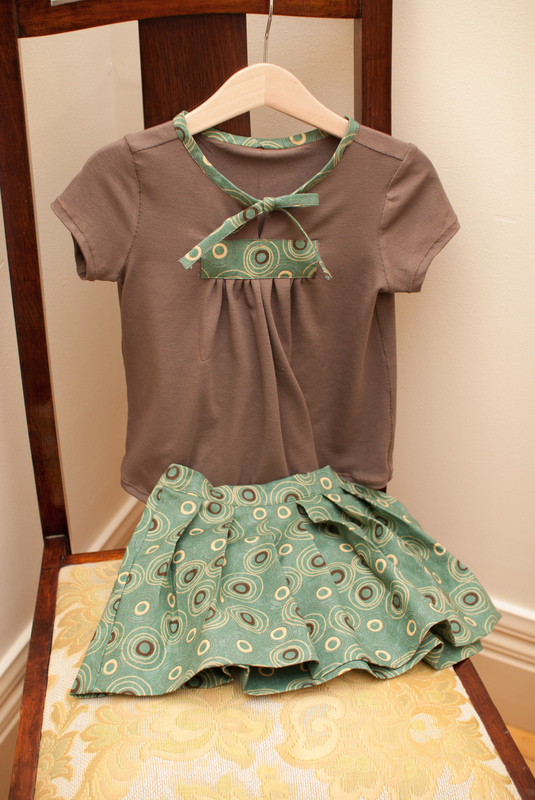 This little skirt is just so sweet exactly as written in the pattern, which is how I made it. (The only change I made was to add length, but I do that to all pattern for this t-a-l-l girl!) Probably my favorite thing about the 2 + 2 skirt is the way the pleats face each other in front and back. My daughter loves the fullness of the 2 + 2 skirt because she loves to run, jump, climb, and cartwheel! I ironed the pleats open, as suggested in the pattern, which makes it very full for play. And, my daughter and I found the perfect vintage button in my stash for the side closure, which you can see here. The 2 + 2 skirt can be customized in so many ways! I’ve chosen several photos photo from the Flickr group to show you some examples. 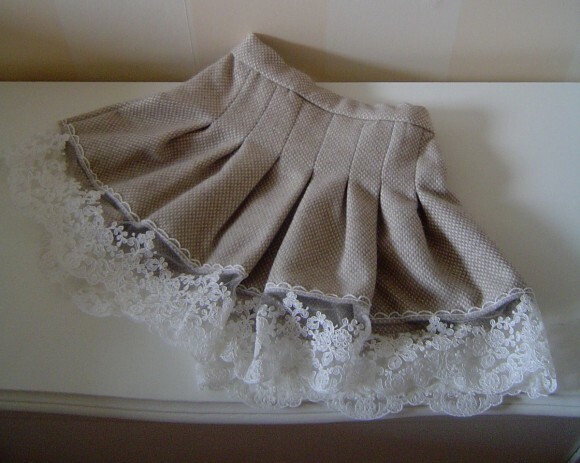 It would be very simple to add lace like this skirt which is so feminine and business-like in a pint size version! 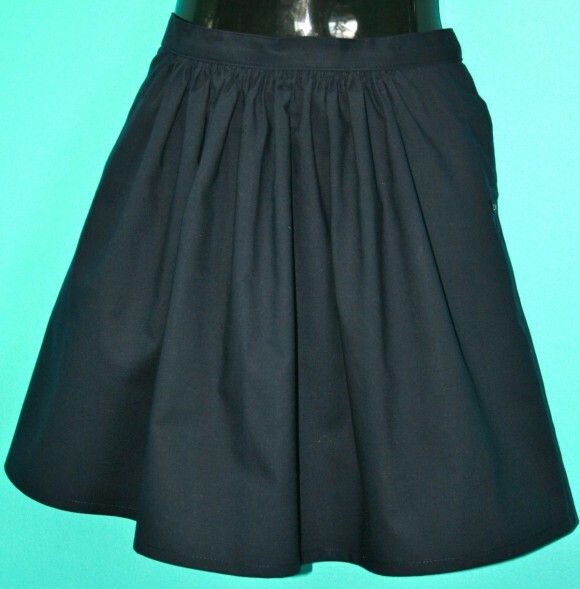 This version of the 2 + 2 skirt has a color block effect at the bottom. A very simple change with a big impact! This version also has the pleats sewn down instead of ironed open. Each look is separate and very lovable! 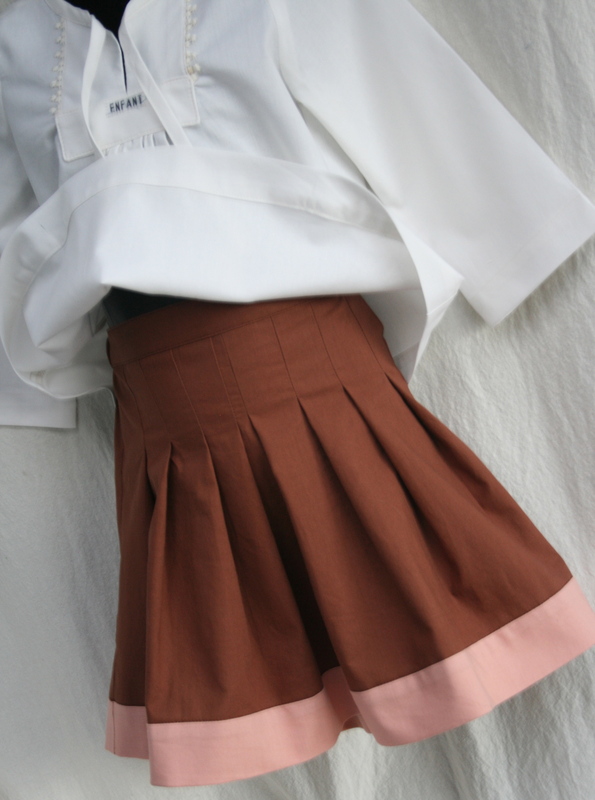 The 2 + 2 skirt is of course the perfect skirt for school uniforms. What is special about this one is the facing inside the hem. Like a little love message tucked inside the skirt! The last way to customize the 2 + 2 skirt that I’m going to show you is to leave it unpleated. 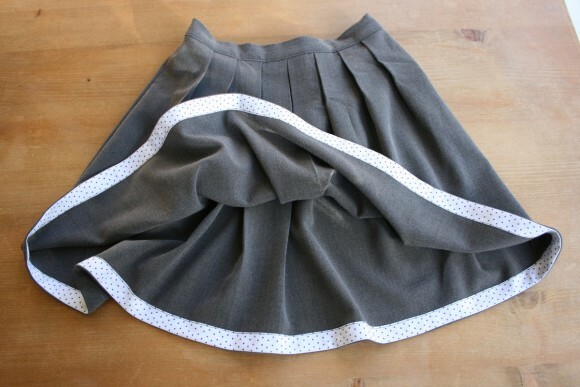 This is the fastest and easiest way to make the skirt, and adds versatility to the pattern. I think I love the 2 + 2 blouse as much as the skirt! I have a weakness for girl’s blouses and dresses that button up the back! 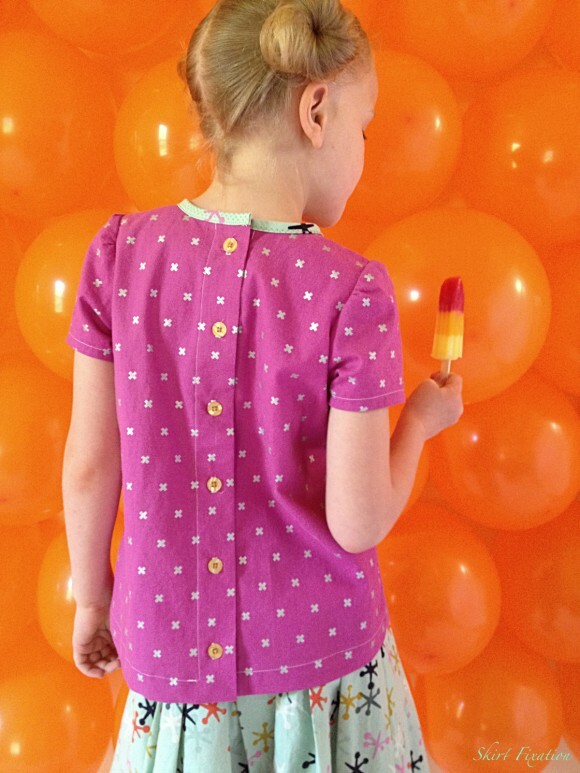 The buttons are one place to add a pop of color if desired, like we did with our blouse. As we did with the skirt, I’m going to show you some customization examples of 2 + 2 blouses from the Flickr group. While the neckline offers the perfect opportunity to coordinate the blouse with a matching skirt, we love the look of this one with ties from the same fabric. The neck ties can be eliminated and replaced with a button closure, like this example. 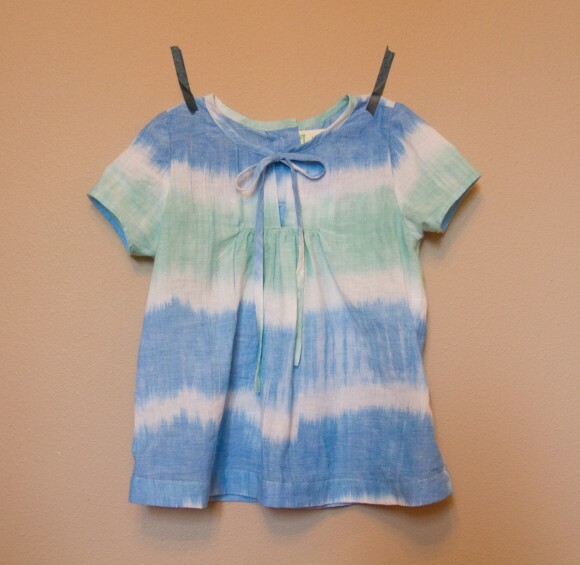 This final example shows the 2 + 2 blouse made from knit fabric. In this instance, the button placket in the back is eliminated, making it the super fast and easy version. The final thing that I love about the 2 + 2 pattern is how it’s perfect for layering under a sweater. The blouse is slim enough to layer well, the neckties peek out over the top, and the lines of the skirt make a perfect silhouette, extending the use of this pattern into another season! Thanks for letting me share my favorite Oliver + S pattern. Now I’m in the mood to sew the 2 + 2 pattern all over again! If you want to see all the Oliver + S skirts I made in one place, you can visit this blog post. Audrey, you’re my hero! 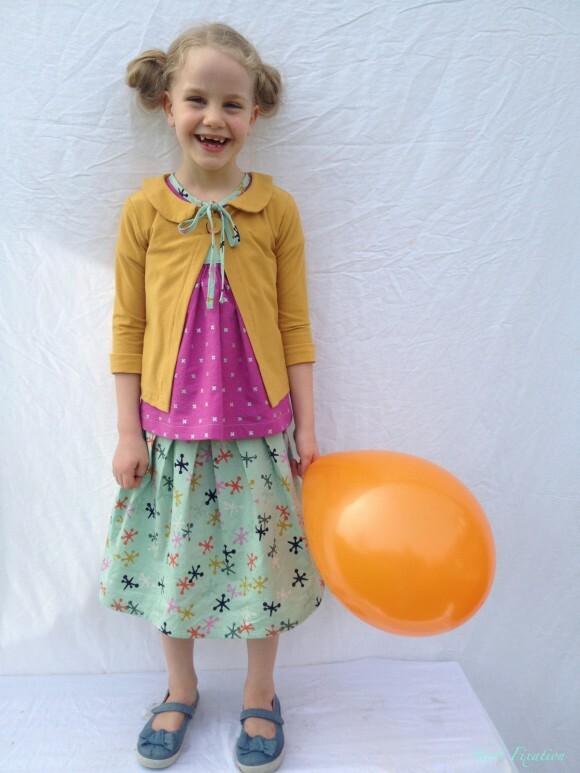 Thanks for the lovely post, but even more thanks for sewing up all our skirt and blogging about them! I love how you styled each of them. Your fabric choices are great! I so wish this one came in the larger size range. We loved this blouse so much. Thank you, Liesl! Your designs are amazing, and every version that I see of your patterns is a winner. That’s one way I know your designs are amazing! 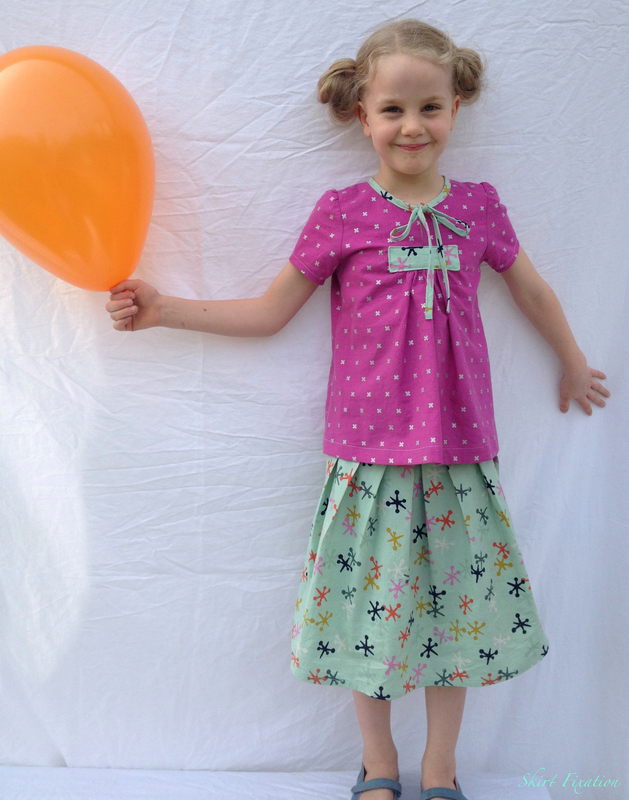 I’m sad I didn’t get around to sewing this skirt (or the shirt more than once) before my daughter outgrew the sizing. And, that last picture with the cardigan is absolutely perfect!